This volume in the point/counterpoint Debating Issues in American Education reference series tackles the topic of diversity in schools. 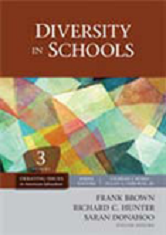 Chapters explore such varied issues as ability grouping, affirmative action, bilingual education, gender bias, illegal aliens in the classroom, mainstreaming and inclusion, and more. 1. Should the Courts Be the Primary Focus in Efforts to Achieve Desegregation? 2. Are Multicultural Counseling Programs in Schools Needed to Improve the Academic Performance of Students? 3. Are Traditional University Preparation Programs the Best Way to Prepare Teachers and Administrators to Teach Diverse Student Populations? 4. Can Race to the Top and Related Programs Improve Underperforming Schools? 5. Is Aid to Schools Under Title I the Best Way to Close the Achievement Gap Between Students Who Are Economically Disadvantaged and Those Who Are Not? 6. Is Aid to Schools Under Title I an Appropriate Strategy for Closing the Achievement Gap Between Minority and Majority Students? 7. Given School Dropout Rates, Especially Among Poor and Minority Students, Should College Attendance Be the Norm for All U.S. Students? 8. Does Incorporating Elements from Popular Culture, Such as Hip-Hop, on School Campuses Help Public Schools Serve Diverse Student Populations? 9. Should All Forms of Ability Grouping Be Eliminated in Schools? 10. Do Current Funding Structures and Districting Criteria of Public Education Marginalize Ethnic and Racial Minority Students? 11. Are English-Only Models the Most Appropriate Means for Teaching English to English Language Learners? 12. Should Gender Be Applied as a Diversity Criterion in Educational Programming and Placement? 13. Is the Full-Service Community School Model for Involving Parents and Community Members From Diverse Backgrounds Useful in Furthering Equitable Educational Opportunity Among Majority-Minority School Populations? 14. Should Pull-Out Instructional Programs Be Retained Under Title I's Compensatory Education Provisions? 15. Should Gender-Based Student Loan Forgiveness Be Used to Increase the Percentage of Male Teachers and Administrators in Public Schools?